There are some people, although hopefully not too many anymore, who still believe that anything wearing a Nissan badge must have come over on a boat from Japan. These same people are also probably the least likely group to ever buy anything which did actually come from Japan. 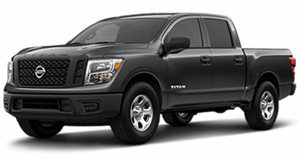 So Nissan's teaser for the new generation of the Titan might seem a little over the top in the way it demonstrates how American it is. Nissan apparently seems to think that there's no subtle way to get this message across, and sadly, that could be correct. The truck does sound cool though, and Cummins diesel power is not a bad thing.